Today’s marketers are rightfully obsessed with metrics. But don’t forget that your customers are more than just data points. And yeah, it’s easy to overlook our customers’ feelings and emotions, which can be difficult to quantify. However, consider that emotions are the number one factor in making purchasing decisions. With so many consumers sharing their thoughts and feelings on social media, it quite literally pays for brands to have a pulse on how their products make people feel. Enter the world of sentiment analysis. Rather than let your customers’ emotions fall by the wayside, brands today can translate those feelings into actionable business data. In this guide, we’ll break down the importance of social media sentiment analysis, how to conduct it and what it can do to transform your business. Sentiment analysis is the process of retrieving information about a consumer’s perception of a product, service or brand. 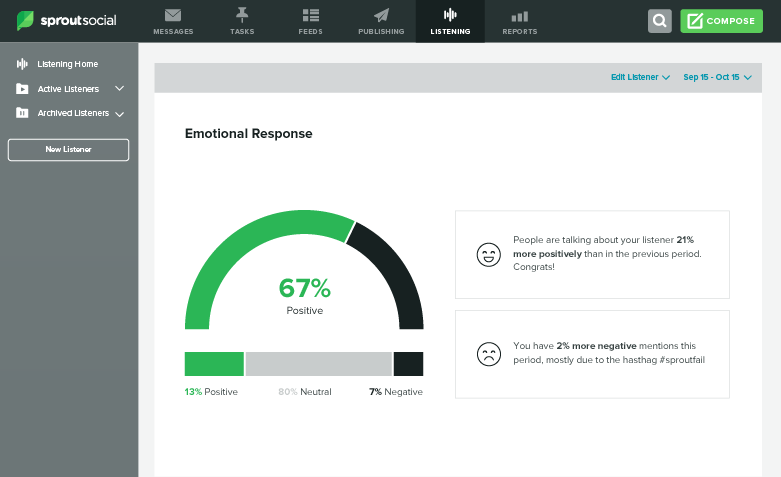 If you want to know exactly how people feel about your business, sentiment analysis can do the trick. Specifically, social media sentiment analysis takes the conversations your customers are around the social space and puts them into context. Think of sentiment analysis as a subset of social listening. While businesses should obviously monitor their mentions, sentiment analysis digs into the positive, negative and neutral emotions surrounding those mentions. Does your product give customers a sort of warm, fuzzy feeling? Are you meeting their expectations with your quality of service? Sentiment analysis can answer these questions and then some. …and a flood of complaints can clue you in on problems with your product or service that need to be addressed. The beauty of social media for sentiment analysis is that there’s so much data to gather. With more and more consumers tagging and talking about brands on social, chances are you can already start analyzing how your customers feel about you. Additionally, social sentiment analysis encourages businesses to take a more proactive approach to social media and engage with their customers directly. With a basic understanding of what sentiment analysis is, let’s talk about how you actually go about conducting it. Although sentiment analysis can result in valuable insights to brands, it’s not without its challenges. As noted, consumers are sounding off on brands like never before. This rings true both on social media and off. Businesses obviously need to be paying attention to their social mentions on Twitter or Instagram where customers are addressing you directly. Doing so is a great way to capitalize on praise and address criticism in a timely manner. That said, you also need to monitor third-party sites and review forums. This includes Google Reviews, Reddit and sites such as Yelp! And if you’re in the realm of ecommerce, your on-site reviews are particularly valuable. Don’t neglect the insights from loyal customers who arguably mean the most to your business. Here’s an example of positive sentiment from one of J. Crew’s product pages. Monitoring all of these platforms manually can certainly be time-consuming. That’s why we recommend a social listening tool such as Sprout for the sake of saving time. 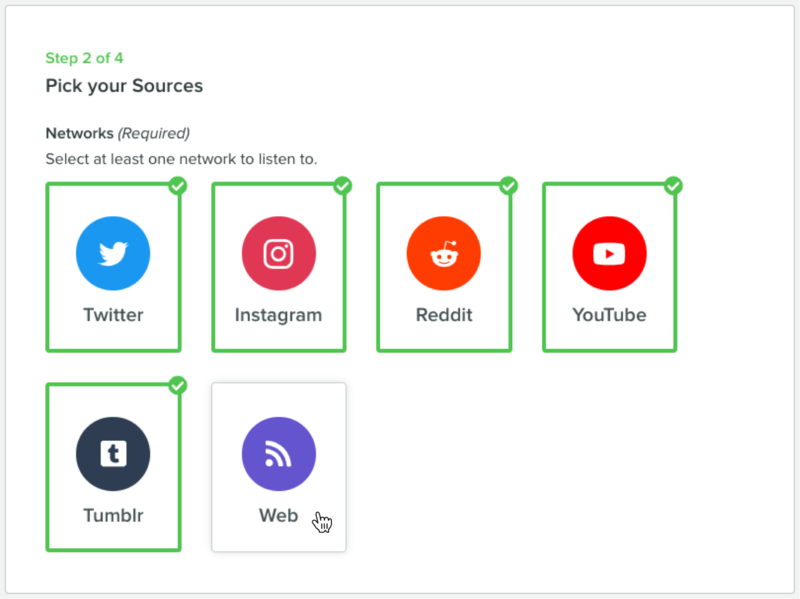 For example, with Sprout, you can pick your priority networks for listening to avoid monitoring your mentions “by hand.” Additionally, you can track keywords related to your brand in cases where customers don’t tag you directly. Sentiment analysis is only effective when you’re able to separate your positive mentions from your negative ones. That means searching for relevant terms which highlight customer sentiment. Some sentiment terms are relatively straightforward and others might be specific to your industry. Either way, your sentiment terms need to be divided into positive and negative terms. Below is a quick example of what some of those terms might look like for a sentiment search. This is where sentiment analysis gets tricky. The volume of sentiment-related terms in your searches doesn’t always tell the full story of how your customers feel. It’s crucial to double-check your mentions and leave some room for analytical error. 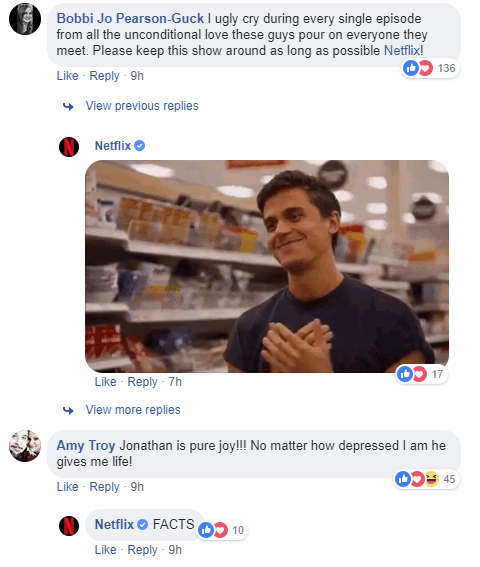 Here’s a good example from Netflix’s Facebook page. Fans are obviously singing the praises of their programming, but they’re also throwing in terms like “ugly,” “cry” and “depressed” while doing so. If you saw those terms pop up in your mentions without context, it might be cause for alarm. Sarcasm can likewise create confusion when it comes to sentiment analysis. When somebody tweets “I love it when I lose my luggage after a nine-hour flight,” they obviously aren’t thrilled about their experience. Although sentiment analysis is going to be accurate most of the time, you’re always going to have these sorts of outliers. A combination of manual listening and machine learning is ideal for getting the most “complete” sentiment analysis possible, which actually leads us to our next point. 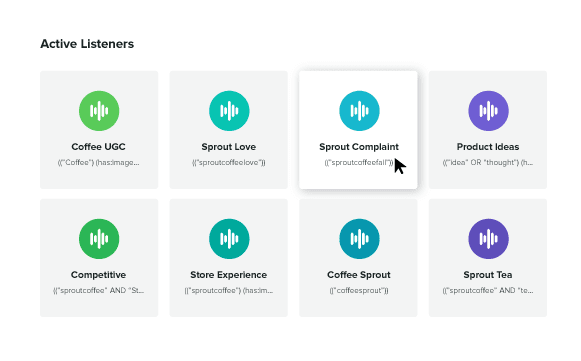 Sprout’s social listening capabilities can help eliminate some of the most tedious and time-consuming tasks related to social listening. The sheer volume of conversations happening right now is reason enough to invest in a third-party listening tool. 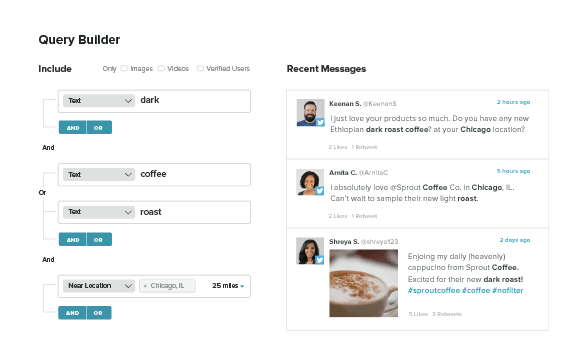 For starters, Sprout monitors and organizes your social mentions in real-time. With the help of our query builder, you can pick and choose terms related to sentiment analysis that you want to track. Meanwhile, your Active Listeners allow for one-click access to queries including complaints, compliments and specific customer experiences. Oh, and don’t forget your sentiment analysis report. Sprout’s report monitors not only your positive, negative and neutral mentions for a particular time period, but also digs into how those mentions have evolved over time. In other words, you can determine whether your brand perception is improving or not from month-to-month. The insights gleaned from sentiment analysis can translate directly into positive changes for your business. Below is a snapshot of some of the benefits of conducting regular sentiment analysis regardless of what you’re selling. 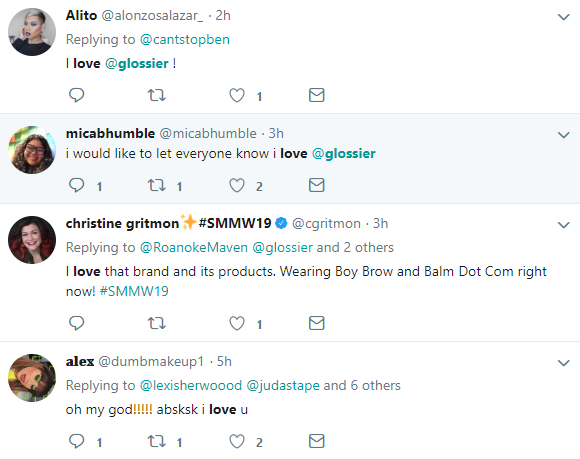 As noted earlier, sentiment analysis encourages brands to keep a closer eye on their mentions. This means being more attentive to comments and concerns as they pop up. Addressing these mentions, both negative and positive, signals that you’re listening to your customers. On a related note, monitoring compliments and complaints can help you understand what people want to see from you in the future. Consumers today are anything but shy when it comes to sounding off, but it’s still up to brands to open their ears for feedback. Just as you want to know how people feel about your business, you should also have a sense of how your audience feels about your competitors. Especially when people are searching for recommendations, multiple brands are tagged side-by-side. Through sentiment analysis, you can understand why someone might bounce to a competitor or prefer their product to yours. Finding your tone on social media can definitely be a challenge. 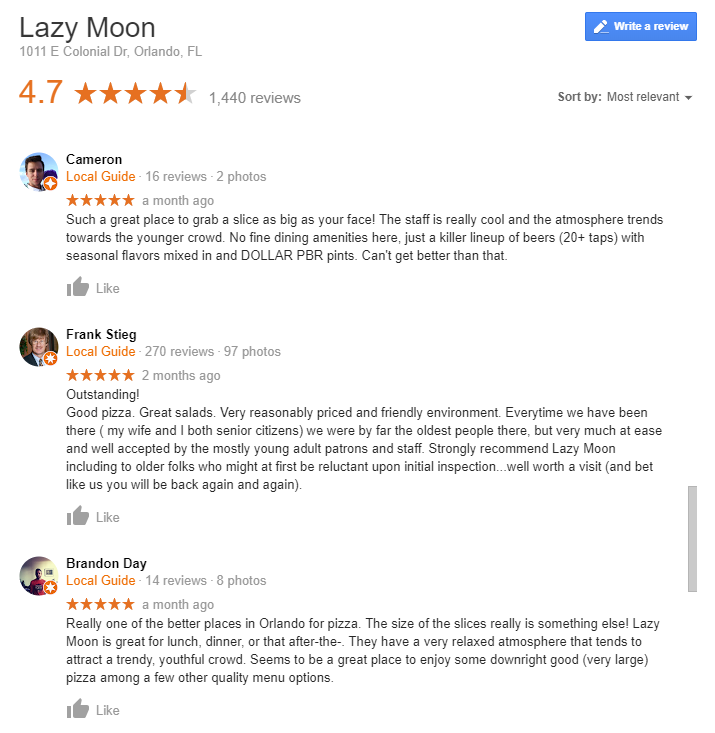 Right now, many customers are engaging with humorous brands like MoonPie specifically because of their snark. Increasing your positive mentions might mean tweaking how you talk to your customers and build more buzz. Just as you mentor your traffic and followers, tracking sentiment over time ensures that you have a positive relationship with your audience and industry. Sentiment analysis is particularly important when your business is making big moves. For example, product launches, pricing changes and another big announcement could see a significant shift in your brand sentiment. Keeping an eye on these numbers on a regular basis can provide you with peace of mind or spot a potential crisis before it occurs. And with that, we wrap up our guide to sentiment analysis! Do you know your followers and customers feel about you? Your customer’s feelings and emotions are simply too important to ignore. Through sentiment analysis, there’s no second-guessing where people stand on your brand. With the ability to monitor and analyze the conversations happening on social media and beyond, you can use those feelings to make actionable decisions on behalf of your business. We want to hear from you, though. How do you keep an eye on your customers’ emotions? 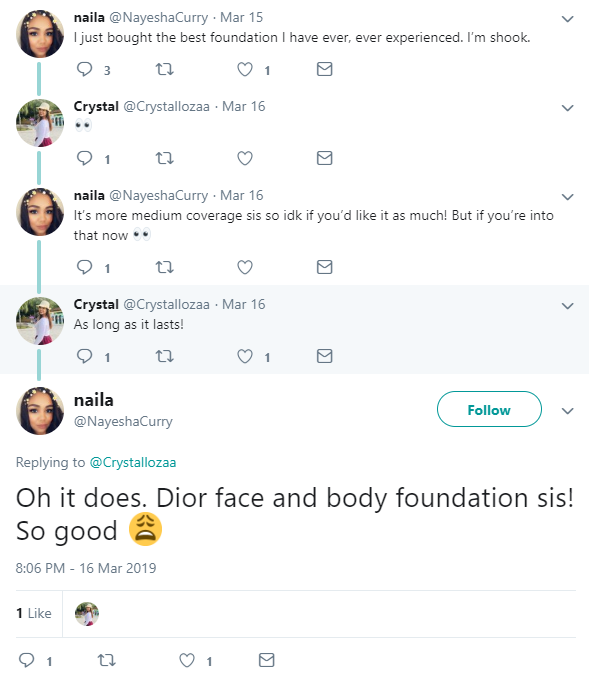 How much stock do you put into your compliments and complaints on social? Let us know in the comments below!